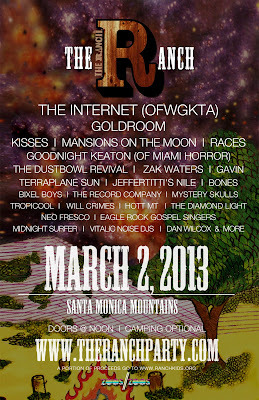 For $40 you can rage all day and night in Topanga Canyon with some of L.A.’s best rising indie stars including Goldroom, Goodnight Keaton (of Miami Horror), The Internet (OFWGKTA), The Dustbowl Revival, Terraplane Sun and more! Remember what festivals were like before they got so corporate? Take it back to that backwoods intimacy at The Ranch. Get your glow sticks and tents ready! Get tickets at www.theranchparty.com or try your hand at winning a pair through us – just contact contest@supergoodmusic.com with the subject heading “Ranch Party” or tweet out @supergoodmusic @jaminthevan @zooszoos #RanchParty to enter! Winner picked on Friday March 1st!